Nanotechnology Conferences 2019 | Amsterdam |JSB Conference. Event Date : 26-27 August 2019 . After the successful completion of Euroscicon Conference on Nanotech and Nanobiotechnology, the Euroscicon is proud to host the 2nd Euroscicon Conference on Nanotech and Nanobiotechnology, which emphasizes on the theme “Challenges and Innovations in Next Generation Nanoscience” and is going to take place in Melbourne, Australia from 26-27 August, 2019 which will provide an unprecedented opportunity to Researchers from all over the world to share their research with colleagues, discuss and debate the latest advances in the field. There are various tracks which are given to subjects like medicine, electricity, pharmaceutics, photonics, industries and many more which are entwined with nanotechnology. The Organizing Committee has done its best to set up a framework that we think will allow for a creative interplay of ideas. All we need now is your active participation to convert the extensive program on paper to an active and vibrant Nanotech and Nanobiotechnology forum. 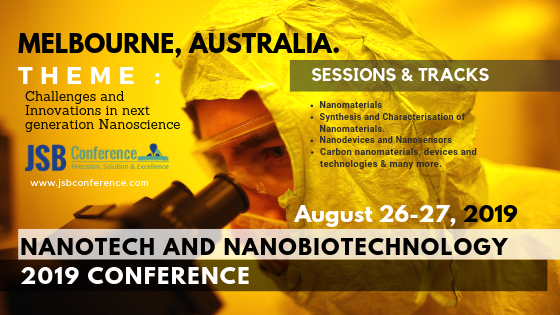 So, in case you have missed Nanobiotech 2018, here is another chance to join us at Melbourne, Australia with an unforgettable meeting.